How many times has the phrase "if only" run through your mind? If only I could go back to school. Start my own business. Find more time for my kids. 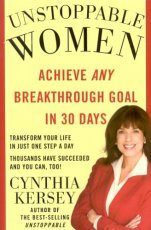 No matter what your "if only" is, motivational speaker and corporate trainer Cynthia Kersey can help you achieve it -- in just 30 days. The Unstoppable Women 30-Day Challenge is a revolutionary plan that's changed the lives of thousands of women. Instead of feeling overwhelmed, you'll complete simple, daily actions that will build momentum and keep you on target for success. It's time to make your "if onlys" a reality. It's time to become Unstoppable.